Yes! If you haven't grabbed everything that you have wanted to before school starts, tomorrow will be a great day to do it! Teachers Pay Teachers is having a Best Year Ever Bonus Sale on Monday, August 22. By using the code OneDay at checkout, you can save 28% off of everything in my store, Speech Universe. With this bonus sale, The Frenzied SLPs have decided to host a linky party to share some great tips for starting the year out right. My tip has to do with being prepared. When starting out the year, I like to make sure I know where my students are in terms of their goals. Many times they slip over the summer, and sometimes they make great gains over the summer! This is never more true than with my students with articulation goals. 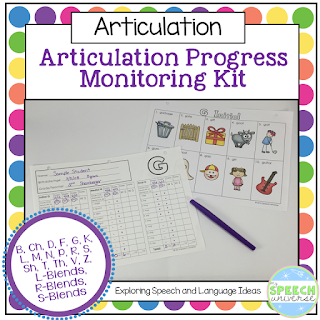 For the last two years, on the first day of therapy, I have used this Articulation Progress Monitoring Kit to see where my students are with their goals. I have loved having this data for myself right at the beginning of the year. Then, two months later when it is progress report time, I can pull out the sheet and easily get data for the report by re-administering the probe. It is so easy peasy!!!! It only takes about 5 minutes to get all the data I need to report on their progress. There is enough space to take data four times on each sound. There is also a place to mark whether you are checking word level or sentence level. For my real little guys, the pictures help out a lot. They can easily identify most of the words. If they are not sure, I do have them just repeat the word for me. My readers have a really easy time getting through these probes quickly. 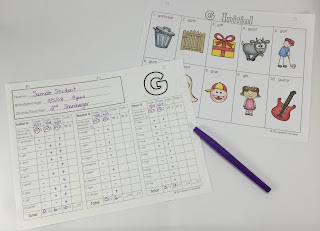 When they move to the sentence level, I have my students make up their own sentences. I tried a prototype where I wrote the sentences, but sometimes the reading got in the way. It is easier to just have my students make up a quick sentence about the word. I find that I get a more true "spontaneous" production of the sound this way. So, if you want to make this your Best Year Ever, you can grab this kit for 28% off in the Best Year Ever Bonus sale on Monday, August 22. Don't forget to use the code OneDay to maximize your savings. 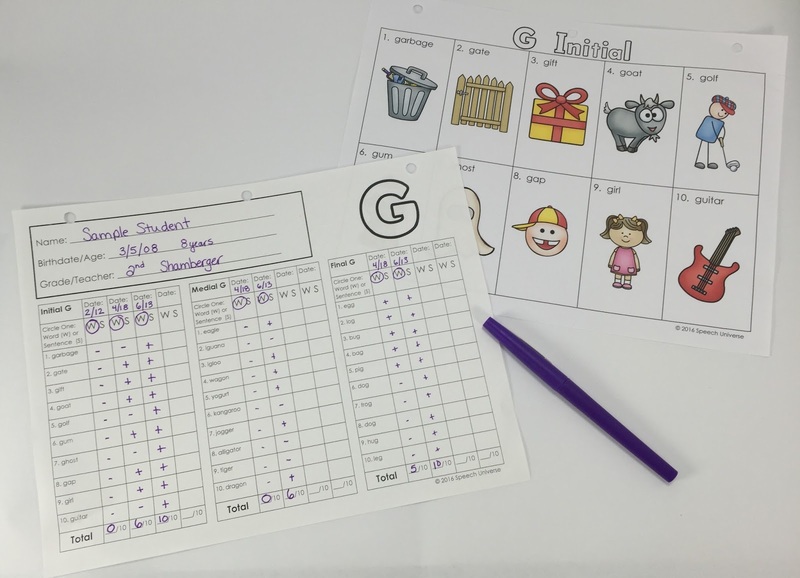 Simply print out this kit, and you will be on your way to great data collection all year! I hope you have a great start to your year! Need more tips to start the year out right? Check out these other great bloggers who have lots of tips for you! Thanks so much to SLP Runner for hosting this linky! It does look fun and easy! Starting a new year is so much work and timesavers really do help! Being prepared is definitely #1 for starting out the new year! I like the way your product is organized. Looks great!! Looks like you are absolutely ready for baseline and beyond. Love the tips and the product! !